On today’s post I wanted to share with you an experience I had that would be so selfish of me not to. 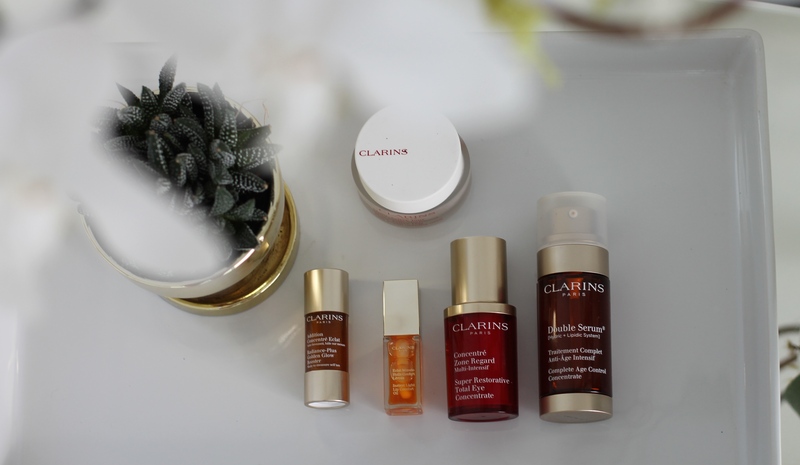 It’s to no secret that I adore Clarins Paris products; I also love pampering myself. My nighttime routine is my time to give myself some TLC. If you follow me on SnapChat (@afancyaffair) you would know that I cannot go to sleep without using my Clarins double serum and super restorative total eye concentrate, but you guys, holy cow! I was recently invited to get a facial/lymphatic node massage at their Spa. (Yes, they have a Spa at the Nordstrom Merrick Park Store!) I honestly expected to sit at their counter and test out a few of their products and go on my marry way. Boy was I wrong! (hence, the photo I took was from my phone). It was completely the opposite. I received a one hour facial with the best products and a lymphatic node massage in a very cozy room… Oh Em Gee!!!! This was the best facial I have ever received in my life! The results?! Nothing less than glowy and extremely hydrated skin. Make time for yourself! If you don’t, no one else will and I honestly believe that beautiful skin requires commitment! The more the merrier in every way when it comes to skin care. PS: For all those Clarins Paris product lovers out there, you know that delicious smell all Clarins products have?! Well that’s the way your face will be smelling for the rest of the day. It’s amazing and I highly recommend it! Below I will list a few other products I highly recommend from them!